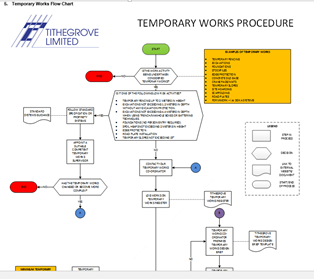 Temporary works are the parts of a construction project that are needed to enable the permanent works to be built. Usually they are removed after use – e.g. access scaffolds, shoring, excavation support, falsework and formwork. The correct design, execution and adaption of temporary works are an essential element of risk prevention and mitigation in construction works. A temporary works failure on a project is almost always a high consequence event. A significant failure may be catastrophic to safety, as well as budget, programme and reputation. Designers are defined in the 2015 CDM Regulations as ‘…an organisation or individual, who prepares or modifies a design for a construction project (including the design of temporary works); or arranges for, or instruct someone else to do so.’ This means that many Tithegrove activities make us Designers under CDM regulations. Safety Team inspections showing no Temporary works issues.